Dude Where’s My Podcast – Episode 1 | Dude, Where's My Freedom? Big news guys! I’m officially launching the Dude Where’s My Freedom podcast! Episode one is available for your listening pleasure…. right now! I’d really appreciate it if you listened and gave me some feedback, but just in case you don’t have the time or the desire to hear me ramble for thirty minutes, I figured I’d also provide a brief outline/summary as today’s post. In the Introduction, I briefly discuss the reason for the podcast as well as the plans for it. As of now, there aren’t really any detailed plans for it to be honest. It’s just something I decided to try and see how it goes. If it goes well, maybe it expands, becomes a regular feature, and includes guests. One of the main motivations for even having a podcast is that I still feel like I’m not that great of a writer. Or, at the very least, that I do a better job in political arguments in a discussion sort of format rather than writing a series of lengthy blog posts or essays or what have you. So in this podcast where I can just sit down and ramble on about a topic for a bit, I actually think that format works a little bit better for me. I’d love to have guests in the future to make it more of a back-and-forth sort of conversational style, but we’ll have to see how this goes first. The main topic of this podcast involves the meme that you may have seen on the Internet where active duty military members are taking photographs of themselves, in uniform, holding signs over their faces expressing their opinions against intervention in Syria. ‘Treason’ Or ‘Free Speech?’ – Are These Anti-Syria Strike Pictures From U.S. Military Members Okay? (Blaze Poll) | TheBlaze.com. The Blaze actually published an article about this exploring whether this was authorized under military regulations, and even hinting that such actions might even be treason. I spend a decent amount of time discussing the various regulations on political speech in the military, including providing a bit of my own experience from nine years in the US Navy, and how these rules influenced my decision to leave. Also discussed (and thoroughly debunked) is the notion that these photographs would be in violation of a UCMJ article forbidding commissioned officers from making contemptuous remarks about the President and other public officials (the photos do no such thing). The next bit of discussion involves whether these photographs are “violation of a lawful order or regulation.” In the event that Obama starts a war in Syria, it is quite likely that any order for troops to deploy there would in fact be considered a “lawful” order, but as of right now, these photographs simply say “If the order is given, I won’t obey it.” That, in and of itself, is not disobeying an order. You cannot disobey an order that has not yet been given. The next bit of discussion regards some common regulations on political conduct by members of the armed forces. This is something I researched quite a bit while I was in, because I wanted to stay within the rules. The main prohibition of political conduct by active duty military involves a prohibition on “partisan political activity.” Basically, you aren’t allowed to identify yourself as someone in the military while engaging in partisan politics. I go on to discuss how that shouldn’t apply to this particular case, because whether to intervene or not intervene in Syria seems to be a completely bipartisan issue. There are Republicans and Democrats on the extreme ends of both sides of the question of foreign intervention. So, as far as I can tell, prohibitions on partisan political conduct would not come into play with these photographs either. Many commenters in the Blaze article make reference to the fact that an order to invade Syria would not in fact be a “lawful” order and troops would be authorized (if not outright compelled) to disobey it. I think this really comes to the heart of the issue. Despite the fact that the military readily acknowledges that some orders are unlawful and must not be obeyed, the culture of the military absolutely does not embrace that line of thinking at all. Individual soldiers are told to shut up and obey orders and let someone else worry about whether the war itself is legal and ethical and such. Anyone who attempted to refuse to deploy based on the notion that the order was unlawful would immediately be in a great deal of trouble and there career would instantly be over (we actually saw this happen in a few prominent cases with the Iraq war during the Bush administration). 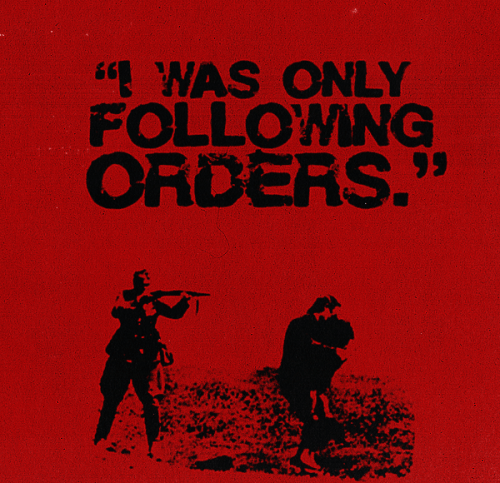 This leads me to a discussion of the “Nuremburg Defense” where Nazi war criminals famously attempted to excuse their actions by pointing out that they were “just following orders.” The global community, led by the United States, famously rejected this defense, setting international precedent that individuals have the responsibility to refuse to carry out unlawful orders. But the average soldier is, of course, required to assume that all of his orders are lawful. He is forced to either obey, or to face immediate (and potentially very harsh) consequences. The system is essentially rigged against him. I then go on to point out that there are various tiered structures of rules within the military. Every specific location and command have their own sets of rules, and it’s entirely possible that various locations and commands have specific prohibitions on their personnel engaging in this type of activity on Facebook. This is almost impossible to know for sure, because the amount of research required would be totally exhaustive. Given this, I’m willing to entertain the possibility that some of the people posting these pictures are in violation of some sort of local or regional policy prohibiting this type of activity. Also, as one last point, I ask the question of whether this would even be an issue if their protests were in favor of intervention in Syria. If they agreed with the President, would anyone even care? Would it be considered bad for the military to engage in political speech if it was incredibly mainstream and popular speech? I tend to think not. To wrap things up, I basically ask for your feedback, as it would be greatly appreciated and will very much help me decide whether to keep this going, make any major changes, or anything else. Please get ahold of me on Facebook, Twitter, or through some other method and let me know what you think. Thanks again for reading and/or listening! This entry was posted in Podcast and tagged just following orders, Military, nuremburg defense, podcast, syria, ucmj. Bookmark the permalink. Get a good mic, have someone help you get that treble echo out, and don’t do your sound mixing or equalizing yourself, it will never sound right to you.